I had quite a few great meals in the bay area. Being the week of my birthday, I got treated a lot, something I really appreciate and am thankful for. Too much food consumed and water over the bridge to be comprehensive but did want to touch on a few high notes. First night Michael took me to Sapore Italiano in Burlingame. His favorite current spot. I am a sucker for great Italian food and this place was indeed excellent. Started off with arancini, the filled and panko covered deep fried rice balls with marinara sauce. Small but lovely and delicious. For my entree I had rooster pasta with duck ragu. Rustic and hardy, just how I like it. Fabulous. Thanks, Mike! I took Gordon, Charlie, Rosemary to Creola, my old mainstay in San Carlos. It was their first time and they were due. Forced Charlie to have the filet mignon, Creola's is my favorite anywhere. I started off with the crab and shrimp bisque, a little cornbread round and ended up ordering the shrimp etouffee which was good but not quite as epic as some other things I have ordered there in the past. I think you have to be in Louisiana to get it perfect. Gordon loved his shrimp creola, Rosemary had the buttermilk chicken. They seemed happy, don't think they would fib to me. Ended up with the great beignets and Rosie got some sort of pudding. They bought. Thank you! Bill, Cam, Rick and I ate at Rocca in Burlingame one night. I had a Fred Flintstone sized monster lamb shank which was scrumptious. The calamari we shared was maybe the worst I have ever tasted. Don't think there was a speck of squid in those limp and languid atrocities. But what a lamb shank! And did I mention that it was free? Think Sapore is frankly a cut above Rocca but who asked me...Thanks boys! Stayed with Big Dave on Monday. We drove into the city and stopped at the Rincon Towers for dim sum at Yank Sing. There is another location on Stevenson St., this one has lovely murals in the lobby of the building. 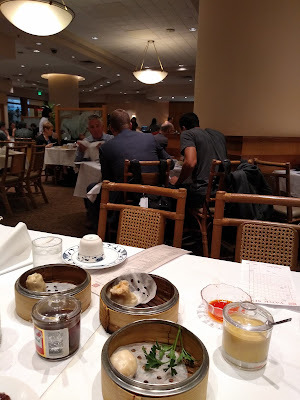 Yank Sing may be the most outstanding dim sum I have ever eaten and I have been around the block a few times. The barbecued pork was unbelievable. No corners are cut, the fish looked incredible too. I really love this place. Rich was late joining us and we ate like pigs in his absence. And he picked up the check! Which is good because we really chowed down. I will say that the xlb dumplings were not as flavorful as I am used to. Lot left to discover there. Need to go back again and pronto. Treat yourself or even better, have someone treat you. Thanks, Rich! We visit the city a few times each year....love Yank Sing. A bit pricey, but wonderful. Glad you had such a nice time!